People have become wealthy in almost every business imaginable – everything from financial services to waste management. However, regardless of industry, most of these wealthy individuals share one trait in common. This common trait is entrepreneurship. Throughout history, entrepreneurs have emerged to build businesses, create jobs, and ultimately generate wealth for themselves. Today, entrepreneurship has taken a whole new dimension. In an increasingly competitive world, it is more important than ever to differentiate yourself, and have diversified streams of income. With technology, ease of distribution, and outsourcing, it is easier than ever to set up your own business (often while still doing your day job!). And the best part is that you own what you’ve created. No one can fire you or lay you off, and you keep all the profits. BUT WHERE DO I START? I HAVE NO EXPERIENCE IN STARTING A BUSINESS! The first step towards entrepreneurship is determining your business model. Ideally, you should pick something that you enjoy – think about your hobbies and how you can use them to generate extra income. 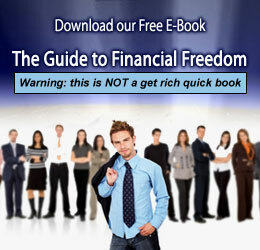 Here are some of the most profitable ideas to get you on the path to financial freedom. 1) Real Estate: More people have become wealthy through rich estate than any other investment – and frankly, the timing couldn’t be better. There are literally thousands of great properties being sold at unbelievably low prices. With foreclosures on the rise, now is the single best time in history to generate lucrative profits. But be careful - real estate is a complex business, and its important to learn the ropes before jumping into an investment opportunity. 2) Blogging: While blogging won’t make you rich in itself, it can provide you with a great source of additional income while you write about something you enjoy. After deciding what to write about, its important to pick a catchy domain name. For example, I chose “Kanjoh” because in the Japanese Shinto tradition, it means a “truthful sermon,” something I believe is needed more than ever in today’s financial world. The first step towards blogging is to get set up with a domain name and server. JustHost.com is a great platform that allows you to search for available domain names that might fit the bill. JustHost also provides inexpensive hosting and setup services (as low as $3.95 per month! ), allowing you get your blog or website running with minimal time and effort. If you already have a blog or website, you should monetize your traffic with contextual advertising. There are hundreds of ad networks available, but its important to separate the good from the bad. One of the best overall ad networks is Commission Junction. They provide a wide variety of targeted advertisements, frequent and consistent payouts, and no fees for enrollment. 3) Day Trading: This is definitely not a business for the faint-of-heart. Day-trading requires upfront capital and nerves of steel. But if done correctly, day-trading can be a very profitable enterprise. If you want to try day-trading, the first step is to learn everything you can about how to trade. The next step is to open a brokerage account that allows you to make a large number of trades at a low cost. This will allow you to maximize the profitability of your trading sessions. The best option for this is Zecco, a fully regulated and insured brokerage service. Zecco gives you 10 free trades each month . Deals like this can help you get started at minimum cost. These are just a few ideas – they are businesses that have been successful for many people, but don’t be afraid to forge your own path as well. Just rememmber, its not enough to just read about it – being an entrepreneur requires some risk and effort! There is no easy route to success, but the rewards will definitely be worth the time put in. Hopefully these ideas will give you the inspiration you need to get started on the road to entrepreneurship. Previous post: Beat the Banks at Their Own Game!